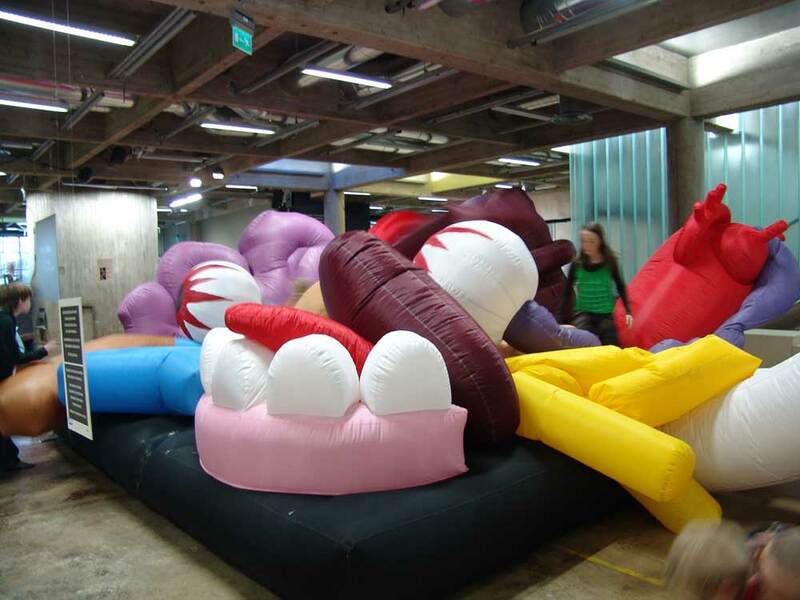 A fun physical sonic sensation, combining huge cartoon-like guts made with “bouncy castle” technique, with interactive electronic sensors driving an audio soundscape derived from 8-bit computer games sounds. 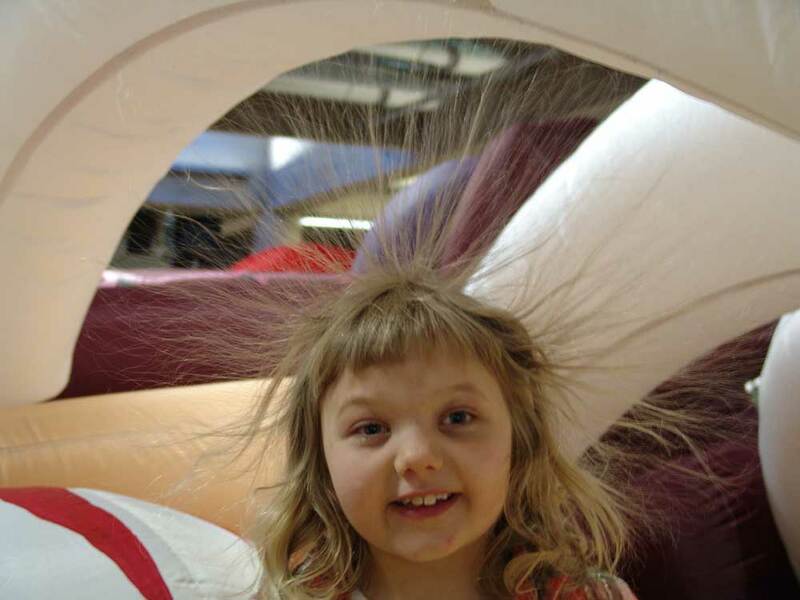 Children (& childminded adults) jump and dive amongst the guts while triggering and creating the sounds in real time. The hysterical fun of the interaction is in marked contrast to the everyday reality of bomb victims’ guts and body parts splashed across our tv screens. 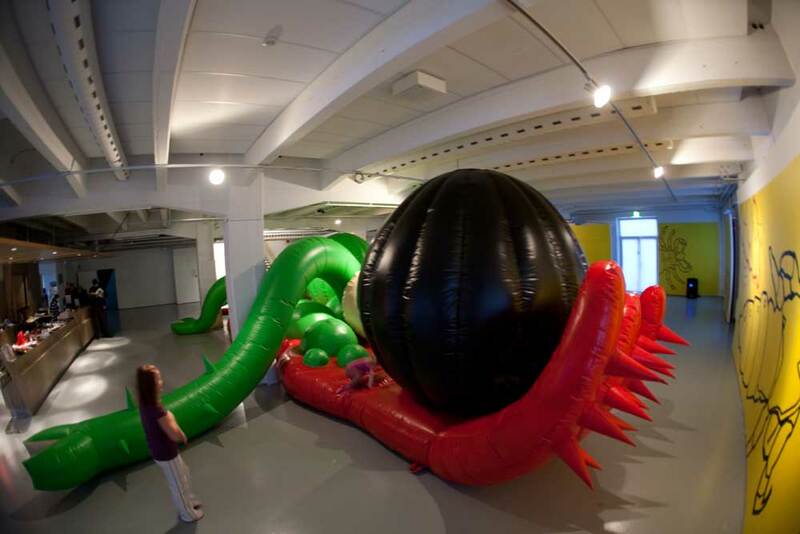 “Laughing my guts out” combines strong physical presence with exciting interactive fun for the participants. Just spectating is enjoyable too. There is no difficult-to-understand user interface – just jump or crawl in and make sounds! Artists Andy Best and Merja Puustinen challenge their audience to examine and question everyday experience by creating an uncomfortable collision between the familiar and the surreal. Having worked together for over ten years, the working process becomes a two way flow of ideas and criticism that results eventually in physical realisation of the art work. Andy and Merja work at the interface between art, culture, public space and the media landscape, and wish to challenge preconceived notions of what is and is not art. 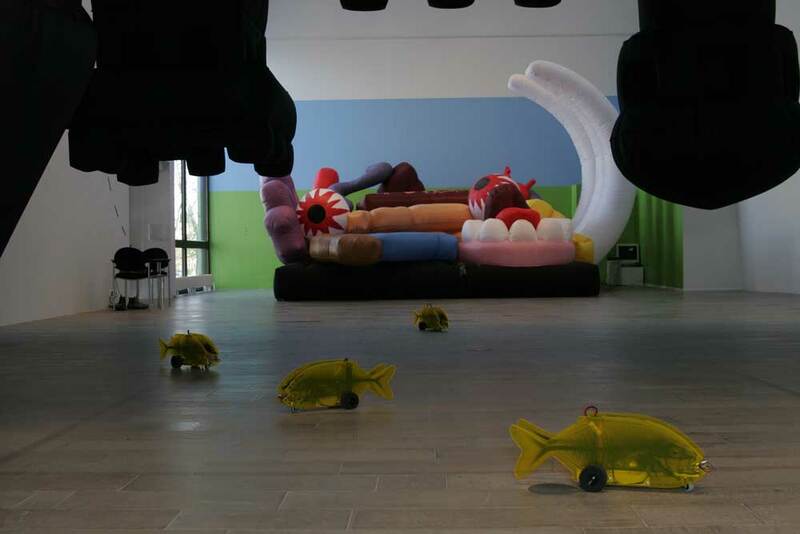 They are particularly interested to break down barriers between the audience and the art work, which in “Laughing My Guts Out” is taken to the logical extreme where the art viewer has to become an active participant and throw their body into the work. The shear physical size of the work creates a dynamic relationship with the exhibition space. These works do not sit within the gallery – they occupy it. They are real and yet unreal – surreal, familiar yet unknown. The audience must step into the presence of the work, become one with it – the works require an audience to complete the conceptual and actual feedback loops. The metaphorical landscapes created in the museum space by these large scale works propose new conceptual and participatory spaces. A creative narrative space is born within the sterile, neutral museum – the space becomes an elementary part of the works.